Ventricular antitachycardia pacing (ATP) therapy delivers pacing pulses to interrupt a tachyarrhythmia episode and restore normal sinus rhythm. ATP therapy is considered painless and requires less battery energy than cardioversion and defibrillation. ATP may be programmed On in the device prior to the delivery of high-voltage therapies. This feature can be found in some Medtronic ICD and CRT-D devices. Please go to manuals.medtronic.com or consult with your local Medtronic representative regarding device models available in your geography. Note: VT and FVT detection zone programming is nominally "OFF"
The three types of Ventricular ATP are Burst, Ramp and Ramp+. One or more sequences (up to 10) of ATP can be programmed for all six VT therapies and for the first three therapies of FVT. VT and FVT detections are nominally set to Off, but when set to On, all six VT (FVT) therapies are enabled. Smart Mode is programmable for each ATP therapy and is nominally OFF. Smart Mode is only available for Rx1 – Rx4 therapies and will turn an ATP therapy OFF, if all sequences of an ATP therapy fail in 4 consecutive episodes. The programmable parameter V-V Minimum ATP Interval (under Shared Settings; nominal = 200ms) limits the pacing interval at which the ATP pulses are delivered within a sequence. The likelihood of accelerating the arrhythmia is reduced by limiting the ATP pacing interval. If the ATP pacing interval is < the programmed V-V Minimum Interval, the pulses are delivered at the programmed V-V Minimum ATP Interval. If all intervals of an ATP sequence have been delivered at the V-V Minimum Interval, the device skips the rest of the ATP therapy and delivers the next programmed therapy. If the device detects a FVT episode, it delivers the next programmed CV therapy. 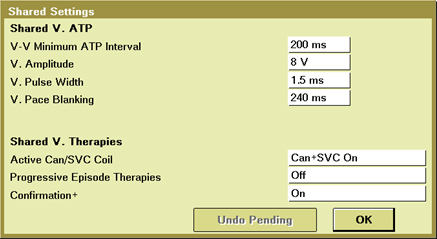 All ATP therapies are delivered at the same Amplitude and Pulse Width (nominally 8 V @ 1.5 ms). Progressive Episodes Therapies can be programmed On or Off for this feature. 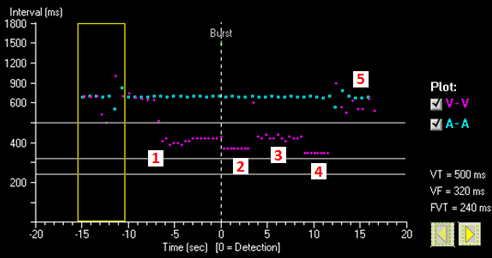 Burst: All pacing pulses delivered are of equal cycle length, between sequences, pulses decrement (Interval Dec). Ramp: Each pacing pulse is decremented by the programmable Interval Dec (ms); an additional pulse is added between sequences. 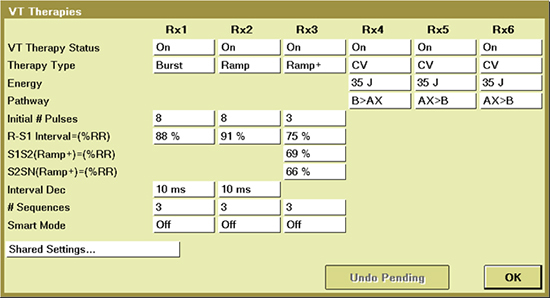 Ramp +: The first 3 pacing pulses are delivered at a programmable percentage of the detected VT. Subsequent pulses are delivered at the percentage of the 3rd pulse. 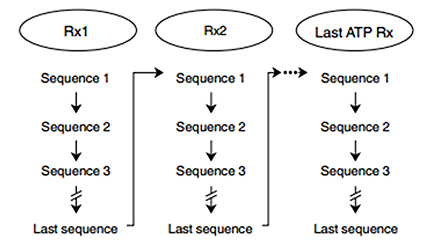 An additional pulse is added between sequences. When a VT or FVT episode is detected and the first therapy (Rx1) is ATP, the device delivers the first sequence of the ATP therapy. If the device redetects the VT/FVT episode, it delivers the next sequence and repeats this cycle until the episode is terminated or all sequences (max 10) in the therapy are exhausted. If all sequences in an ATP therapy are unsuccessful, the device starts delivering the next ATP or cardioversion therapy (Rx2). If it detects that the current VT episode has accelerated (by at least 60 ms) or redetects the VT as FVT, the device skips the remaining sequences of an ATP therapy and starts the next programmed therapy for the episode. The ATP pacing interval (R-S1 Interval = % RR, S1S2, etc.) is based on the detected ventricular tachycardia cycle length, which is calculated as the average of the last 4 ventricular intervals prior to VT or FVT detection (or redetection). The smaller the RR%, the more aggressive the ATP therapy is considered. VT and FVT therapies – ATP therapies should not be used exclusively to treat VT or FVT episodes. At least one VT therapy and one FVT therapy should be programmed to a maximum energy cardioversion. Therapy aggressiveness – VT and FVT therapies must be programmed to be increasingly aggressive. For example, one VT therapy cannot be programmed as a cardioversion and a subsequent VT therapy as a ventricular ATP therapy. Likewise, a VT cardioversion therapy cannot be followed by another VT cardioversion therapy with a lower energy setting. Ventricular ATP therapy is illustrated in the Interval Plot shown below. Wathen MS, Sweeney MO, DeGroot PJ, et al, for the PainFREE Investigators. Shock reduction using antitachycardia pacing for spontaneous rapid ventricular tachycardia in patients with coronary artery disease. Circulation. August 14, 2001:104(7): 796-801. Wathen MS, DeGroot PJ, Sweeney MO, et al., for the Pain FREE Rx II Investigators. 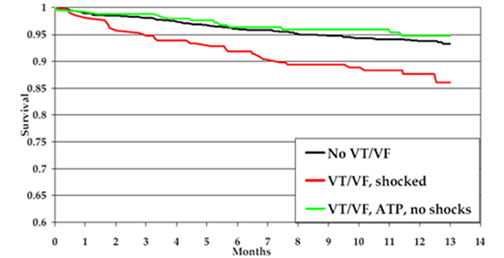 Prospective randomized multicenter trial of empirical antitachycardia pacing versus shocks for spontaneous rapid ventricular tachycardia in patients with implantable cardioverter-defibrillators: Pacing Fast Ventricular Tachycardia Reduces Shock Therapies (PainFREE Rx II) trial results. Circulation. October 26, 2004;110(17):2591-2596. Wilkoff BL, Ousdigian KT, Sterns LD, Wang ZJ, Wilson RD, Morgan JM. A comparison of empiric to physician-tailored programming of implantable cardioverter-defibrillators: results from the prospective randomized multicenter EMPIRIC Trial. J Am Coll Cardiol. July 18, 2006;48(2):330-339. Wilkoff BL, Williamson BD, Stern RS, et al, for the PREPARE Study Investigators. Strategic programming of detection and therapy parameters in implantable cardioverter-defibrillators reduces shocks in primary prevention patients: results from the PREPARE (Primary Prevention Parameters Evaluation) study. J Am Coll Cardiol. August 12, 2008;52(7):541-550. Sweeney, MO, Wathen, MS, Sherfesee L, et al. Differences in Effects of Electrical Therapy for Ventricular Arrhythmias on Mortality in ICD Patients. AHA Abstract 2008. Circulation. 2008; 118S_672. Gulizia MM, Piraino L, Scherillo M, et al. A Randomized Study to Compare Ramp Versus Burst Antitachycardia Pacing Therapies to Treat Fast Ventricular Tachyarrhythmias in Patients With Implantable Cardioverter Defibrillators: The PITAGORA ICD Trial. Circ Arrhythmia Electrophysio. 2009;2:146-153. Sources: Medtronic Protecta,™ XT DR Clinician Manual, Medtronic Protecta™ XT CRT-D Clinician Manual.